We've been asked, "Why does BP not offer a ratchet-style instep or toe strap?" There are two major answers. First, a "ski boot" kind of product can put undue pressure on delicate skin and soft tissue on the top and sides of the foot, areas that are already at risk with age, diabetes and immobility. Second, those products can interfere with transfers, and they're generally not needed with proper ankle support and well-adjusted footplates. Of course, some wheelchair athletes during play and competition opt for temporary strapping across the foot for maximum stability, and where ankle movement is less desirable. In some sports, a foot strap is required by rule to avoid contact with the field or court, as well as for safety. But for all-day comfort, our approach is to center the foot and secure the ankle while still providing for a dynamic position. BP offers hook-and-loop and side release versions of our Ankle Huggers® that install onto our highly-adjustable nylon-coated slotted footplates (or others), and optional toe straps for users that need extra lower foot stability. These work very well together, and most users do not need the toe straps. What many find unique about our Ankle Huggers is the unique geometry of our laminar pads™, which hug the curves of the ankle, providing support while holding their shape over time and permitting movement while keeping the feet centered. 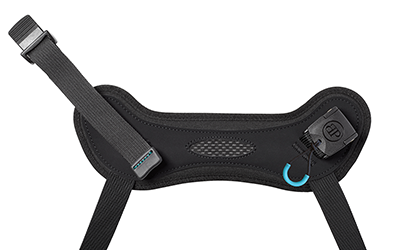 And our durable, one-of-a-kind reinforcement patch avoids tears between the straps and pads. What are your foot support concerns? Let us know in Comments! Such a very useful concept. Thanks for sharing with us. Keep it up.